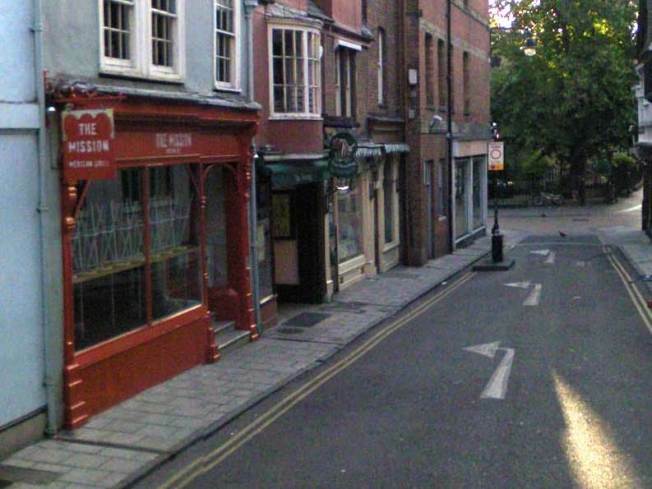 If you're in England and hankering for a burrito, you can head to 8 St. Michael's Street in Oxford to get your fix. Already a hit from New York to China, the Mission-style burrito has now crossed not just the Pacific, but the Atlantic, too. The Mission Mexican Grill is a new chain of burrito joints in the United Kingdom, with two locations in Oxford and one in Reading. For £4.95 -- or about $7.49 -- you can stuff your face with a "Carnitas" burrito featuring "slow roast pork, seasoned with thyme, bay leaves and orange zest then cooke for hours until fall apart tender. Sounds authentic-ish! However, don't mistake it for a true taquerìa -- the tacos are served on flour tortillas, and there's no mention on the menu of aguas frescos. Also, chips cost extra, and chips with salsa more again. But if you ever wake up in Oxford with naught but a £5 coin in your pocket, now you know where to go. As one Oxford student exclaims, "One burrito at lunchtime and I was still full at supper." Next stop for San Francisco's silver bullet? Hopefully India -- we have dosas in the Mission, so clearly a Mission burrito joint on the subcontinent is only fair. Jackson West hopes they're making their own crema, at least.